WASHINGTON (Reuters) - Twelve days after being named special counsel to investigate Russia's role in the 2016 U.S. presidential election, Robert Mueller delivered a speech to his granddaughter's high school graduating class at Tabor Academy in Marion, Massachusetts. "You could be smart, aggressive, articulate, indeed persuasive, but if you are not honest, your reputation will suffer," Mueller said. "And once lost, a good reputation can never, ever be regained. The saying goes: If you have integrity, nothing else matters, and if you do not have integrity, nothing else matters." Mueller, a 74-year-old decorated Vietnam War veteran and former FBI director known for his tough, no-nonsense leadership style, has faced unremitting attacks by Trump on his integrity as the Republican president has tried to discredit the investigation and the special counsel himself. Trump declined to sit for an interview with the special counsel's team. Mueller, a longtime Republican, was named by the Justice Department's No. 2 official, Rod Rosenstein, to take over the Russia investigation after Trump fired FBI Director James Comey, whose agency had led the probe. Mueller has looked into whether Trump's campaign conspired with Russia and whether the president has unlawfully tried to obstruct the investigation. Trump, facing political peril from the inquiry, has used Twitter, campaign-style speeches and comments to news media to assail Mueller, accusing him of running a politically motivated, "rigged witch hunt;" going "rogue;" surrounding himself with "thugs" and having conflicts of interest. "It's all a big hoax," Trump said on Friday. Mueller has been a fixture in American law enforcement for decades and is considered the architect of the modern FBI, serving as its director from 2001 to 2013. He was first appointed to the post by Republican President George W. Bush, then his appointment was extended by Bush's successor, Democrat Barack Obama. Mueller took over as Federal Bureau of Investigation director a week before the Sept. 11, 2001, attacks on the United States by al Qaeda militants that killed about 3,000 people. By the time Mueller left the position, his tenure was exceeded only by J. Edgar Hoover's 48-year stint. 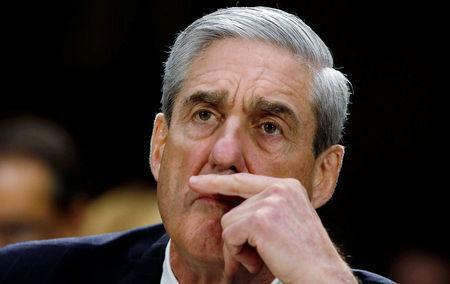 Mueller was known by some as "Bobby Three Sticks" because of his full name - Robert Mueller III - a moniker that belies his formal bearing and sober approach to law enforcement. Mueller's Russia investigation already has yielded a series of guilty pleas and a conviction in the only trial held to date. Trump's former campaign chairman Paul Manafort was convicted on eight charges and pleaded guilty to two others, receiving a 7-1/2-year prison sentence. Trump's former national security adviser Michael Flynn, former personal lawyer Michael Cohen and former campaign aides Rick Gates and George Papadopoulos have entered guilty pleas. Longtime Trump adviser Roger Stone has pleaded not guilty to charges. The big question is whether Mueller will present evidence of criminal conduct by Trump himself. Such findings could prompt the Democratic-controlled House of Representatives to begin the congressional impeachment process laid out in the U.S. Constitution for removing a president from office for "treason, bribery, or other high crimes and misdemeanors." While Trump has hammered away at Mueller, others have defended the special counsel's integrity, including some formerly associated with the president such as former White House attorney Ty Cobb. "I think," Cobb said in an ABC News podcast interview, "Bob Mueller is an American hero."